Recently, work has been busy and stressful. "Life shouldn't be so difficult." So says the optimist in me. After careful considerations, I think the optimist is right. I may face tough and difficult days now and then, but overall, I tend to have more happy days than tough ones. Happy days usually do not require too much. A well-baked cake, a warm sunny day, a great movie, meeting up with old friends, a stroll in the park after the rain, an encouraging comment on my blog, a facebook message from an old friend. These are all things that can make my day brighter, happier. lime can really make my day too! I love this post. It resonates peace and contentment. You make me slow down in my rush life! Thanks Petunia. I'm contemplating if I should write a blog in Chinese.. 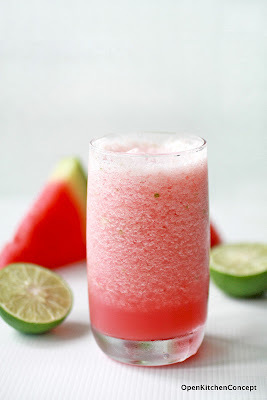 Sometimes, I do think some thoughts are best expressed in Mandarin..
Malar - oh do, if you blend watermelon with some lime juice and lime peel (just very little bit of the green part) and ice, it's a really refreshing drink!